The World Heritage Centre is launching a crowdfunding initiative and a fundraising concert to assist the families of those who lost their lives protecting Virunga National Park. On 9 April 2018, six guards of the Virunga National Park and their driver were killed in a deadly attack. Tragically, this was not an isolated incident. Since 1996, over 175 people have lost their lives in attacks on the Park. Virunga National Park has been inscribed on the World Heritage List since 1979 because of its exceptional biodiversity, including endemic and rare species, such as the mountain gorilla. 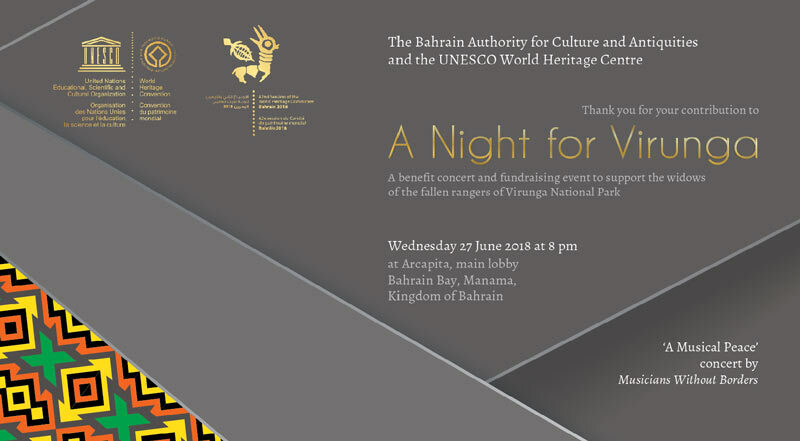 On the 27 June, 2018, a special fundraising event in the form of a benefit concert will take place at the 42nd session of the World Heritage Committee (Manama, Bahrain). This event is jointly organized by the World Heritage Centre and the Bahrain Authority for Culture and Antiquities (hosts of the World Heritage Committee) in coordination with the Institut Congolais pour la Conservation de la Nature (ICCN). an ensemble of professional musicians of different nationalities, cultural backgrounds and languages who use music to break down cultural boundaries. Proceeds from the event and donations will go towards the Fallen Rangers Fund, a project which was launched to provide a financial safety net for the widows and children of Virunga rangers killed in the line of duty. In the words of the Fallen Rangers Fund “A ranger’s greatest fear is not losing his life, but the impact his death will have on family members left behind”. The rangers of Virunga National Park give years of dedicated and courageous service as caretakers of this magnificent World Heritage site, help us pay tribute to them by contributing to the wellbeing of the families they have left behind.